Egyptian Magic Cream Review (2018): Is It Really Worth Buying? Egyptian Magic All Purpose Skin moisturizing Cream, US $39, is an all-in-one solution to all your skin and hair moisturizing needs.However it may cause skin itching. This product is brought to you by Egyptian Magic, a product launched in 1991 but, which its founder, Westley Howard has been perfecting in 1986, reportedly at the instruction of an Egyptian doctor. According to an interview with the founder, this cream’s formulation has been inspired by centuries old Egyptian traditions, and is created in the same way as the creams left sealed with and used on mummies beautiin Egyptian tombs. What are the Ingredients in Egyptian Magic Cream? Does Egyptian Magic Cream Have Any Side Effects? Dramatically moisturize your skin, it restores your skin’s optimal hydration levels. Promote faster and more efficient skin healing from burns, scars, and other forms of skin damage. Relieve skin from irritation and other forms of inflammation, including sunburn and skin conditions such as eczema and proriasis. Provide deep conditioning to restore your hair’s healthy texture and bounce. Used regularly, it helps prevent premature signs of aging. Honey: Contains Vitamin C, Calcium and Iron, all of which are essential for promoting skin health, it also helps restore significant volumes of moisture that plumps and promotes your skin’s density. Beeswax:It carries antiviral, anti-inflammator roperties. It acts as a protective wall by sealing in moisture in our skin but it may cause itching on skin. Olive Oil: It is uses as a anti-aging antioxidants and hydrating agent for skin. How to Apply Egyptian Magic Cream? 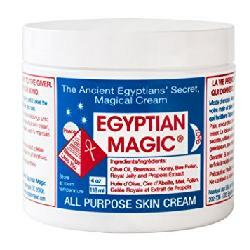 Use Egyptian Magic Cream for whatever moisturizing, healing and strengthening functions that you require. This product however must only be used externally. Apply on affected areas or, use on dry or cracked skin surfaces to help boost and restore optimal moisture content. Egyptian Magic Cream as been formulated with basic and yet powerfully moisturizing and healing ingredients that it can be used in several ways to help improve your skin, hair, and nail health, to name a few. This product contains only naturally derived ingredients that are well known to hydrate and heal, and excludes ingredients that are well-recognized for their toxic and irritating effects but it may cause itching on skin. This product is significantly more expensive than other face products that are formulated to moisturize your skin and keep it wrinkle free. Based on the ingredients list and reviews, minor side effects may be possibly experienced when using Egyptian Magic All Purpose Skin Cream. Egyptian Magic All Purpose Skin Cream is expensive for the ingredients it is packed with. It can be a good skin aging prevention strategy but, if correction is your strategy, you may need to amp up your regimen with something that has more scientific basis to it rather than tradition. However this product cause skin itching.This product offers 100% refund policy.